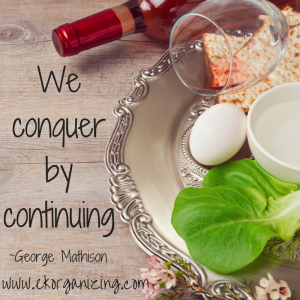 Welcome to Week 2 of the Pre-Pesach Plan, also known as T-3 weeks. If you haven’t completed Week 1, you can find it here. By now, all that’s left of Purim are the empty junk food wrappers, the extra weight, and the sugar-fueled squeals of hyper children. It’s time to enter the Pesach zone. Remember: No Panic Allowed Beyond This Point. This week is a good time to get started on the rooms of your house where you don’t normally bring food. Customs vary here but most people agree that this is NOT the time for spring cleaning. The goal of Pesach cleaning is to remove any trace of chametz from your home. The rooms that do not have food should take a relatively short amount of time to clean. For those with young children, it’s a good idea to check clothing drawers – it’s amazing how far a Cheerio can go! It’s also time to put up signs or any physical barrier near the eating areas, reminded everyone to shake, shake, shake the crumbs off before proceeding to the rest of the house. In addition to cooking ingredients, it’s a good idea to start buying many of your holiday food items. 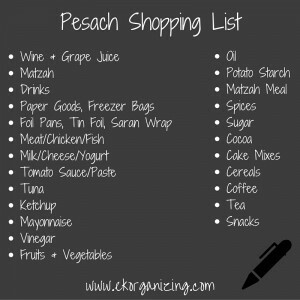 If you wait until too close to the start of the holiday, you may find the shelves sadly empty as the stores don’t usually re-stock Pesach items. You may need to divide this list between this week and next so you don’t buy your perishables too early. Prep the Pesach Kitchen and Let the Cooking Parade Begin. If you don’t have a Pesach kitchen, I’m so very sorry. Also, you can skip right to the next tip; I’ll have more for you in week 4. For those of you lucky enough to have a separate kitchen that you use for about one week a year: Congratulations, you get to start cooking! Hooray! Since you planned your holiday meals last week (do it now if you haven’t), it’s time to polish off the shopping list you’ve started (or use the one I’ve provided), organize your recipes, and create your cooking schedule. I don’t know about you, but I couldn’t survive without my freezer. If you’re one of those “I like to serve only fresh food” people, you too can skip to the next tip (don’t forget to stay tuned for week 4). Empty and clean one of your freezers to make room for the Pesach deliciousness that is on the way. When holiday cooking, I like to work in categories: Fish one night, chicken the next, etc. I also leave a night free in between two nights of cooking to give me time for packaging, labeling, and cleaning the kitchen, not to mention the non-Pesach house duties that don’t magically get put on hold for the next few weeks. Do whatever works best for your household. Your shopping should match your cooking schedule: If this week is fish and chicken, don’t buy the roasts yet. Don’t forget to set out your supplies – freezer bags, permanent markers for labeling, tin foil. I like to start with something easy to get the Pesach mojo going so the first thing I make is the Chicken Soup. I have a huge stock pot and make enough for the entire holiday. Once soup is cooled, divide into freezer bags, label, and freeze. Voila, your cooking journey has begun. On chicken night, I usually prep 3-4 sauces and spice rubs and set out 6-8 foil pans of cleaned chicken pieces, 2 pans for each sauce/rub. This way I get 6-8 meals of chicken with minimal labour expended. I do the same for cooking the fish and the roasts. Continue Keeping Track of What’s In Your Freezer and Pantry. During the next few weeks, keep planning meals based on what’s left in your freezer and pantry. The more space you can free up now, the more cooking and preparing you can do in advance. It might mean buying and preparing fresh food for the next little while but keep meals simple. Allow for pizza every now and then – the goal is to lessen the panic, not add to it. And hey, who doesn’t love cereal for dinner? Now that you know what clothing everyone in the family needs (see Week 1), it’s time to create the shopping schedule. For me, shopping for clothes is a nightmare – add three kids and I’m hiding in my room ‘til Pesach is over. So I get how stressful this part of the list may be for some of you. Do it one step at a time, and one store at a time, and I promise even the worst shopper among you can get your family fashionably ready this year. Like with cooking, divide your shopping needs by category so you don’t find yourself running from store to store and then back again. Shoes one day, suits the next. Shopping this week will leave you time to find matching accessories and make any necessary alterations during the next couple of weeks. Remember to book any hair-cutting/hair-styling appointments. Stay tuned for Week 3 – where we continue the cleaning, shopping, and cooking. Never say I don’t know how to show you a good time.